Grinding and high-speed grinding of straight flutes on tools such as drills and reamers, cutters for paper shredders, clamping tools or guide rail profiles. Producing surface profiles, e.g., on balance pins, drive shafts or square-shaped surface profiles on tools. Grinding round material to final dimension with HSG technology. Used in large series, e.g., in the automobile industry or in tool production..
Grinding helical flutes in drills, reamers, pump rotors, worm gear shafts or ball bearing spindles. 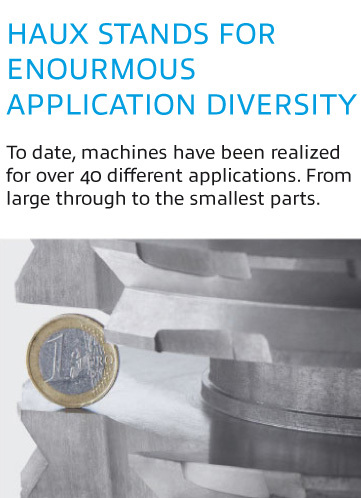 HSG technology on very small workpieces. Used in, e.g., flute, center and relief grinding of twist drills and screw taps. Flute grinding with HSG technology with a special piece as an example. Used with very long flutes. The workpiece is ground on both sides in rotation. Manufacturing flutes in 3 planes. Simultaneous feed motions for height, length and width. Used in countersinks for instance. Producing gearing, e.g., for pump gears. As HSG special machines also for producing threads and gearing in high quality. Grinding shafts with HSG technology. Used primarily for shaft diameters. Used frequently in the automobile industry in the past. Creating pointed and conical shell ground sections. Used in conical shells and twist drills for instance. Producing grooves with long groove lengths using very narrow grinding wheels. Used for instance with collet chucks and to separate pieces with CBN grinding wheels. Producing special pointed shapes, e.g., for twist drills. All common shapes and special shapes are possible. Sharpening blades, as in the example. Used, for instance, for cutting tools in the recycling industry. Grinding chamfers on rotation-symmetrical parts such as surface bevels on twist drills or milling cutters. As a special application, e.g., for sharpening milling cutters. Producing tools of cemented carbide. For instance, by grinding flutes for milling cutters, breaking out face sides, sharpening and grinding surface bevels. The design of the machine results from the application or the combination of applications. Whether as a standard machine or special machine, the desired application can be realized via the modular machine concept.